More families and supplies make it past IDF in return to northern Samaria homes 10 years after Disengagement expulsion. 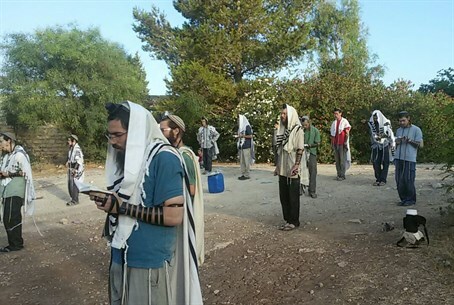 The dozens of families that returned to their homes in Sa-Nur in northern Samaria early Tuesday morning have started their second day in their old town on Wednesday, saying it is "two days that, G-d willing, will turn into a permanent (stay)." In returning to their abandoned homes, the former residents marked ten years since Sa-Nur was forcibly evacuated along with three other northern Samaria towns and Gush Katif in Gaza as part of the 2005 Disengagement plan. The 20 or so families, accompanied by roughly 200 supporters from around the country, are continuing in preparing the town for habitation again. Currently, a bill is making the rounds which aims to repeal the Disengagement with regard to northern Samaria and officially return the expelled Jews to their homes.